It's been nearly 24 hours since I saw Steve Jobs , Danny Boyle and Aaron Sorkin's film about the late Apple CEO, and my mind is still filled with a thousand thoughts and questions about the movie. It's not an easy film to process, nor should it be — after all Jobs was said to be an incredibly complex person whose life surely couldn't fit into one simple narrative. Luckily, the cast and crew of Steve Jobs held a press conference after the movie's New York Film Festival screening on Saturday to answer some of the audience's inquiries, of which, unsurprisingly, there were many — including Qs on how the movie's star got inspiration for his performance. The answer? Oh, just that Michael Fassbender "studied" Ashton Kutcher, the star of Jobs, the first biopic of the icon to hit theaters, in order to get a sense of the character. Yes, really. "Obviously, I don't look anything like Steve Jobs," Fassbender said, to a big laugh from the audience. "The first thing that I said to Danny was 'well, you know, Christian Bale [who originally was slated to play Jobs] looks a lot more like Steve Jobs." Yet Boyle wasn't worried about Fassbender's looks, telling the actor that he wanted to capture "the energy and essence of the man" more than the physical appearance. 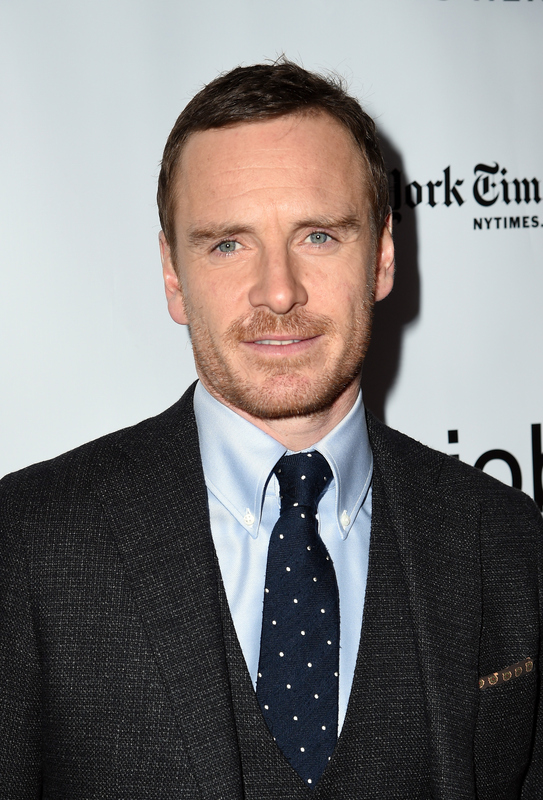 So for much of the film, the only thing Fassbender changed to look like the CEO was "put in brown contacts." Yet a bit more than halfway through, he and Boyle decided to bring in some of the "more iconic" pieces of Jobs' look: "The black turtleneck, and the jeans, and the New Balance." The decision ended up helping Fassbender get in character, with his co-star Winslet telling the audience that she recalled the actor saying, "I really feel like him now" once he looked the part. Sorkin revealed that early on in production, when hearing Fassbender read through a long list of his legendarily heavy dialogue, he worried that he was in danger. The screenwriter told star Jeff Daniels, "Listen, Michael's a really big Irish guy, and I think he's gonna beat me up." Thankfully, it appears that no cast or crew was hurt during the making of Steve Jobs. Despite playing one of the tech world's biggest icons ever, Fassbender admitted that he wasn't actually too familiar with the products Jobs created. "Obviously, I knew who he was, but I'm not very interested in technology," he said. "I use it pretty poorly. So everything was new to me." When it was time for Fassbender to talk, his co-star Kate Winslet said, "Over to you, Fass B." I love it. Although Fassbender said he enjoyed playing the part of Jobs, he also admitted that getting into character took a toll on him. "I kind of lived with him for those months that we were filming," he said, "So every day was all about him... I was either reading the script or I was listening to YouTube clips of him... so he was kind of in and around me the whole time." Because of that immersion, the actor said that he "was actually quite happy to put him aside" at the end of filming and move onto another role. "When we finished," he said, "I kind of washed it all away." It'll be hard for viewers to forget Steve Jobs, though, when it hits theaters on Oct. 9. This is a movie you won't want to miss.